The secondary wine market in Australia represents only a fraction of annual domestic wine sales (3.5%), and the secondary market in premium Bordeaux, Burgundy, Champagnes, super Tuscans etc. trades on a quarter of that. In other words, Australia does not import a lot of premium wines and those that do arrive in the country are held onto tightly by a few knowledgeable individuals and groups, trading amongst themselves the most prized and sought after wines. When and if they do find their way onto the Australian wine auction market they cannot reach the prices being achieved in overseas wine auction markets as Australia does not have the same interest and demand that other countries do. Australia imports only the tiniest fraction of the world’s quality wines, so there is not a lot of them available here, that in turn affects the interest generated and the marketable pool of available bidders and potential vendors. When imported wine comes to auction it rarely reaches the price it was originally released for in Australia, often reselling at wholesale figures back to collectors. There are less options available for you when selling your imported wine in Australia than if you were only selling local Australian bottles. You can sell on consignment through retailers but their reach into the market is limited and commission can be as high as 40%, your bottles can sit on the shelves for months at a time. You cannot sell alcohol on Ebay unless you obtain a liquor license. The best option is via a specialist auction house. However, you need to be aware that the local Australian market is not the same as selling them into the overseas market and, at best, you can expect to achieve what you paid for them at release. The fact is that the only people who make money from imported wines are retailers and auctioneers. We have produced a comprehensive document detailing your various choices for selling wine in Australia and a rundown on the top specialist wine auction houses in Australia. The words and tasting notes of international wine reviewer Robert Parker still have a huge effect on the price of Bordeaux and some of the other wines imported into Australia. It is not as pronounced as in the past but a 100 point score from Parker can create a shortage of wine and in turn inflate some wine prices beyond the reach of most wine buyers and will generate a premium when selling the wine at auction. In February 2008, Hong Kong removed import duties and other control measures for imported wine. Within a year wine imports had surged by 80% (and corresponding sales), feeding a new found appetite for premium Bordeaux and other well-known luxury brands into an ever expanding Asian upper class. Hong Kong became the trading hub of the world’s top wines with all the major wine auction houses running regular auctions and turning over tens of millions of dollars per auction, and achieving record prices for wines never before achieved. In 2014 the market has matured and whilst demand for the best wines is still present the buyers are more cautious and are showing more respect towards the wine auction process. Hong Kong is still a vibrant trading hub for the worlds best wines where major international auction houses are represented. Australia does not have a representative auction house in Hong Kong (yet) and if you wish to trade there you will need the equivalent of $100,000 worth of first growth Bordeaux with excellent provenance for the international auction houses to take any interest in your Australian held imported wines. Australia imposes a number of restrictions and taxes on imported wine. As well as the equivalent of around 40% in various taxes, that effectively kills any premium that may be generated in the secondary market, there are rules and regulations governing the approval of the labels that can be used which makes it difficult for smaller imported labels from gaining any traction. I have noted a few suggestions below if you wish to expand your knowledge and appreciation of fine imported wine. Any of these online meeting places for wine enthusiasts are fantastic places to find out what wines are drinking well from a community of like-minded individuals. They are excellent wine networking opportunities. 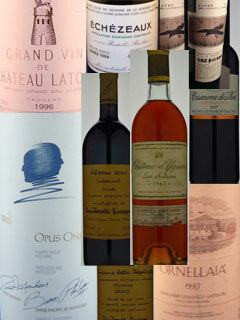 Some of the most popular wine reviewers that regularly taste the wines of the world.